Small Town Main Streets Are Coming Back! The words “Small town main streets coming back” are making headlines on television, radio and newspapers across the United States. I heard the news on the radio one day. Apparently we are getting tired of the urban sprawl and shopping malls and returning to our roots. Old main streets in small and large communities across America are being revitalized by mom and pop shops, arts and culture and unique niche shops that have locals and tourists coming back to the main street of America to shop. I noticed the comeback recently as I have visited small and large communities in the area. I had the pleasure of visiting Lake Mills, Northfield, Shakopee, Bricelyn and Kiester. Even tiny Walters is a destination to eat with diners coming for the great food at R&R Roadhouse Bar & Grill. Driving through other small communities I have noticed the change in their main streets. No longer are the dilapidated historical buildings an eyesore. Many now stand proud having been restored to their earlier glory, or to a state of beauty that fits in with the historic nature of the buildings. Well-taken-care-of buildings on main street America reflect the pride of the community, the heritage and the people that now have a vested interest in the community, and that is, its residents. As I drive through the main street of Albert Lea I stand in awe at some of the old architecture and beauty of the buildings and dream of the past. I notice the change in the buildings as they are being brought back to their former beauty and treasured and cherished as a part of history. We live in a throwaway society. Those who lived through the Great Depression were savers. They threw nothing away because there was no money to replace things, and that attitude lived long past the time that the Depression was over. People my mother’s age had stuff, but much of the stuff were not things of value. Families today have stuff. They have their electronics, their toys, their clothes and the list can go on. They don’t keep it unless there is a little hoarding itch in their bodies. Things are dumped in trash, sold on a garage sale, and interests move on to the next best thing. Homes are built alike and buildings and stores look alike in the strip malls of America. I recently visited a restaurant in a strip mall and was pleasantly surprised to find it was a fine dining restaurant, but it didn’t have the ambiance that a restaurant in an old restored building such as Jonnie Beans, Club 57 and the Starfire Restaurant located in the refurbished Miller-Armstrong building in Waseca has. The strip mall restaurant won’t be remembered after it is gone. The strip mall will be another building on the landscape, probably torn down for something new to replace it. We are no longer valuing our new architecture. We are building throw away buildings. I have to tell you that there is a different feeling walking down a main street in a small town that has valued their buildings and promoted their buildings as much as they have their businesses. Perhaps it is because I remember small town America that I feel this way, yet, I have to believe even those younger like the feeling of the atmosphere of the old buildings. Exploring the main streets with my granddaughters is something we like to do. They admire the brick buildings and ooh and ah at the stores we visit that have been restored back to the original decor with the tin ceilings and the brick walls. These children learn to value the history of America every time we frequent a place that has taken a look at its roots, and tried to get back a little of the history. 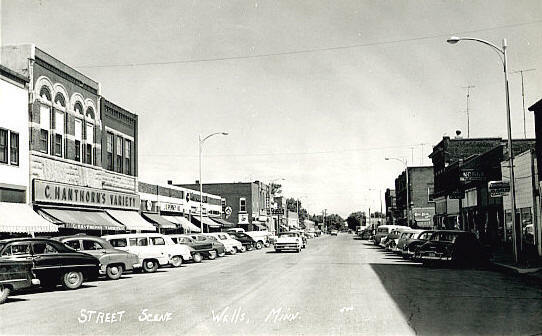 What sparked this column about the main streets of America? As I listened to the broadcast on the radio of the re-emergence of Main Street, I happened to be driving down the main street of New Richland after a visit to Northfield. I lived in New Richland for 10 years and I was checking out the community and reliving old memories. New Richland, small as it is, takes pride in its main street. The trees that line the streets lend a welcoming shadow to the buildings that were painted and updated and restored. It screams the small-town cozy feeling of the warmth of the past, welcoming and comforting to those who might walk the street. I noticed the revitalized New Richland Library in a building that I previously remember being in pretty bad shape, but the beauty was restored. As I was listening to the radio I was admiring small town Main Street. Good job, New Richland. We can’t save all of the architecture on Main Street, but those that are saved are bringing back Main Street USA. That’s what the program said. People are coming back to the main streets with the restored buildings and businesses that have relocated in these buildings. There’s one other thing I noticed while visiting Main Street in many small communities, and the revitalized mom and pop businesses in larger cities, that is, the greeting you receive. You won’t find the friendliness, the helpfulness and the customer service that you get from mom and pop in the big-box stores. There are no generic greetings from Mom and Pop or their employees whether you are a regular customer or a stranger. Mom and Pop on main street make you feel like you have come home. Visiting with Diana Sullivan at Lady Di’s Antiques and the owners of the new Vintage, Shabby, Restored, Recycle store in downtown Shakopee, I felt as if I were talking with old friends and in a much smaller community such as my hometown instead of a metropolitan area. Eating the rolls from the bakery in downtown Shakopee that had been there for 35 some years, reminded me of the bakeries such as the former Fran’s Bakery and the Wells Bakeshop in my hometown of Wells. Visiting the small shops in Northfield gave me the same satisfying experience. It was worth wandering off of the chain store train to come back to the value of the past when customers were your friends and family, and were important. Who wouldn’t want to visit a community that shows pride in the history of their buildings, shows pride in their businesses that fill those buildings, and lends history and friendliness to your visit? Welcome back, small-town main street. You were missed. Next Writer’s Block? Create Something Else and the Muse Will Be In.